This is a traditional black tea picked in the early spring, big attractive fat leaves has a rich flavor with lingering notes of honey and smoke. The aroma is strong sugary and floral with a slight roasted undertone. A high quality Yunnan black tea for everyday drinking. PREPARATION: To prepare Yunnan Black tea we recommend either a regular teapot or individual steeping cups. Allow approximately one teaspoon of leaf per person and very hot, but less than boiling water [90°-95°C (194°-203°F)]. Infuse for 1 to 3 minutes depending on desired strength. 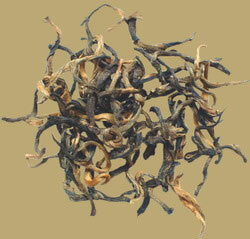 Superior Yunnan Black may be resteeped 10-20 times.